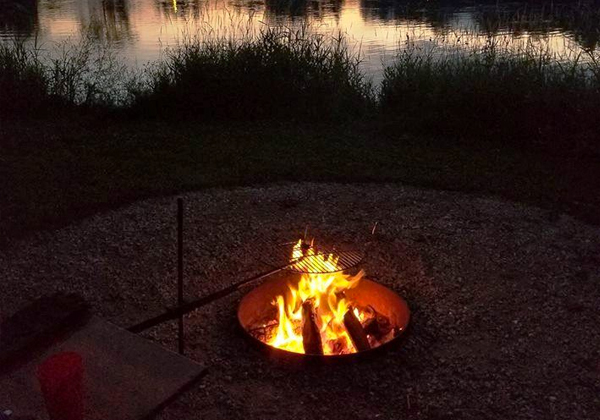 When you camp Memorial Day, Independence Day or Labor Day weekends in 2019 get a fifth weeknight free when you’ve paid for four nights!! 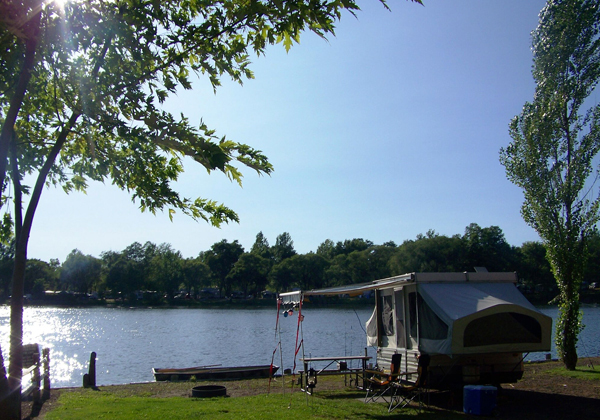 Camp anytime during the rest of the camping season get a fourth weeknight free when you’ve paid for three nights!! This offer applies to sleeping cabin rentals too!! Enjoy the day with Early Arrival 9:00 a.m. to 12:00 p.m. for $10 if your campsite is available. Stay and Play with a late checkout (till 8:00 p.m.) for $10 if your campsite is available. Reservations require a 2 night minimum (3 night minimum Memorial Day 2018 & Labor Day 2018). Extra Adults – $10 / Person. Extra adults (21+) must stay in the same camping unit. There can be no more than 1 camping unit on a site. Visitor Day Pass – $10 per adult(21+), $5 per kid 5-20, FREE per kid 4 and under. All visitors must stop in the office upon arrival and register. Visitor passes expire at 9:00 pm. Only two vehicles are allowed per site so guests may have to park in an overflow area. Dogs – Per Columbia County Ordinance all dogs must be restrained and controlled at all times. Dogs shall be on a maximum of a 6 ft leash and kept quiet at all times! All Dogs must be registered and tagged before entering the campground. No pets allowed in cabins. Dog rules are posted. Failure to follow the rules will result in a $20 charge for each violation and having to remove your dog from the premises. $100 cleaning fee if a pet is taken into the cabin. Extra Tent for kids. If there are only one or two adults (age 21+) registered on the site, then one extra tent may be setup up for kids(up to age 20) at no extra charge. If there are three or more adults, then an extra tent is $50 per night in addition to the extra adult $10 fee per adult. A maximum of 6 adults (21+) on a site. when you’ve paid for three nights! Up to two adults & children 20 and under. 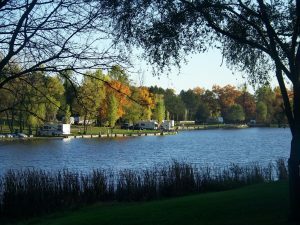 Being a seasonal camper gives you the opportunity to maximize your camping experience as well as your summer vacation. 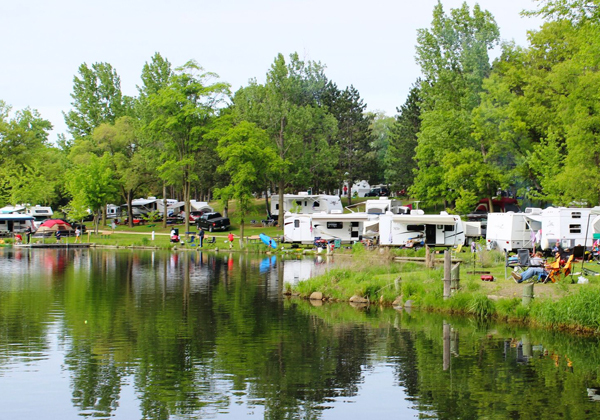 Choosing a seasonal site saves you time from towing your RV back and forth, packing and unpacking and setting up and taking down camp. It also saves you money on gas. 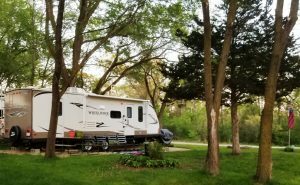 Leaving your RV on site allows you the ability to return and use it as much as you would like during the camping season. The seasonal rate includes water and sewer. Electricity is metered so each family pays for their own usage. Please contact us for details and seasonal site availability at 608-429-3244. Please help us protect our trees and protect the beauty of the campground and our surrounding area. To help prevent the spread of gypsy moth, emerald ash borer, oak wilt and other invasive pests and diseases, USDA and WDATC Certified firewood is sold here at minimal markup to cover our costs. This is a serious problem and we ask our campers to take it seriously too. Please enjoy a campfire with your family knowing you are doing your part to protect the environment.